We are so pleased to welcome Rwandan artist Frederick Ndabaramiye to Santa Barbara for a special pop-up art show at Silo118 (118 Gray Avenue in Santa Barbara) on October 10 from 5:30-8:00pm, sponsored by Silo118 & The Squire Foundation. Frederick's story is one of incredible triumph and accomplishment. In 1998, several years after the Rwandan genocide, Frederick was on a bus that was stopped by a military group. The group, called the Interahamwe, had been active during the genocide; they ordered Frederick to kill the other passengers on the bus. He refused; the militants then murdered all the passengers themselves and cut off Frederick's hands in order to send a message to others: this is what happens if you do not do what we say. Surviving, barely, Frederick spent the next six months in a coma and ultimately suffered from severe depression. 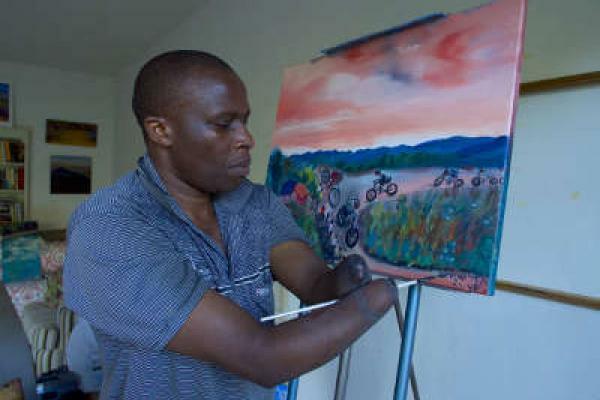 Once he emerged and made up his mind to fight for his life, he became an advocate for those with disabilities, sharing his story through painting, biking, and community involvement. He is co-founder of a community center in Rwanda which teaches practical skills to adults with disabilities, and includes a preschool and elementary school, built in part with the help of Santa Barbara's Congregation B'nai Brith. His story is told in a short documentary, called I am Able, by Santa Barbara filmmakers who met Frederick in Rwanda. The film incorporates paintings made by Frederick in Santa Barbara. Please join us at the gallery for this very special opportunity to meet Frederick and see his work! For more information, contact curator Bonnie Rubenstein at bonnie@silo118.com.